A lot of people even dont know that this country exists, neither they know that it is not anymore Czech-slovakia OR Slovenia OR even Russia. Slovakia, a country with a lot of secrets, possibilities and beauties you can discover as a human being. 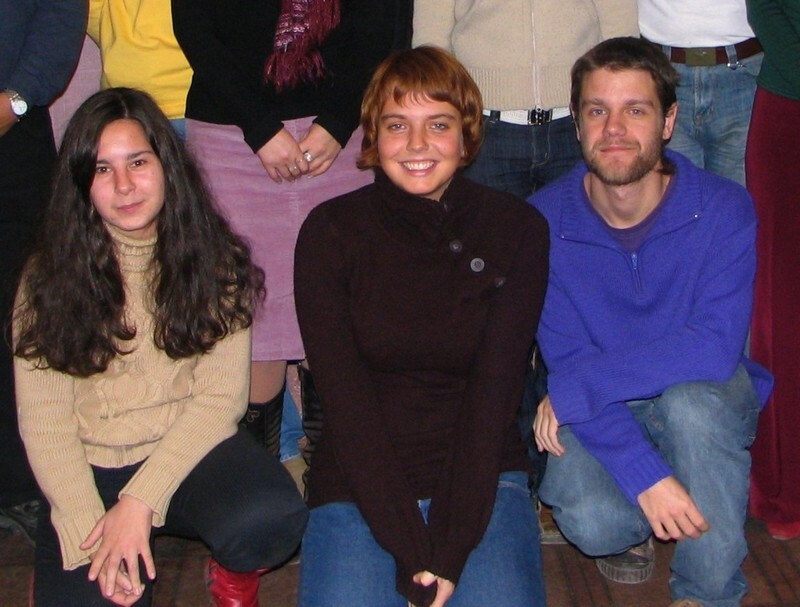 We, the volunteers, Masha, Daniel and Paula a mixture of two nationalities, spanish and german got the chance to deep into the Eastern-European way of living. When we arrived in August 2009 we all didnt know what we have to expect from this year. Paula and Daniel didnt know a lot about this country and we all were curious what we will do, see and feel during our EVS-time. We would like to introduce you know in our life as a volunteer in Stara Lubovna and try to transfer our feelings and emotions we had during this year. Daniel is from Spain, the Andalusian part. He is 25 years old and studied history in Sevilla, his home-city. Paula is from Germany, Leipzig, 19 years old and finished the High-school in Germany. Masha, 20 years from Berlin, also finished her High-school and had always the dream to go Slovakia and realize her dream of living there. Paula was the first in Slovakia. Masha arrived exactly one day after her. And Daniel, still in his spanish time and with his spanish organization arrived three weeks later. The first days were full of ,,discovering the new town,, , to catch the the atmosphere and to help in cvc with reconstructions. Because, against our expectations, we founded a cvc full of collegues in dirty clothes, a lot of cleaning Instruments and a wonderful working-atmosphere. Everybody took part in the works for reaching fast the goal: ,,working with children,,. So we painted, cleaned, carried, joked a lot and became part of the working system in ,,centrum-volneho-casu,,. Then in autumn we had our On-Arrival-Training with wonderful trainers. We were introduced to the other volunteers in Slovakia, learned a lot about this country and its habits. Since this trainingwe had connection to hole Slovakia and deep friendships were created. The so called: ,, magic- triangle,, ( Stara Lubovna- Brdaka-Nitra ) had a lot of fun in the nature in the flats in projects and on parties. We went to several cities, mountains, made birthday-parties. In CVC we were introduced to the collegues, to our work and to the system. Marta, the director, asked us, what we would like to do. We could chose between language-courses, cooking-courses, dancing courses and other clubs. We all were working as language teacher in our native language. During the week we gave courses for children, youth and conversation-courses. Furthermore we helped in the so called: Roma-club, where you work with Roma-children, organized CVC- activities and helped to realize them. You will not have always a ,,job,, in cvc. They are times when you are needed from the morning till the evening and times were you spent your time with the internet and counting the points on the wall. If you have a will to work you can have a full week of work and clubs and courses, but you can also spend a lazy year at home just watching feritales and just doing the things, which are really necessary. CVC offers you a big possibility how to involve your ideas of a youth-work. You are free to develop your ideas and to integrate your work into this of all collegues in cvc. In our free time we all developed in different ways. In general you have quite a lot of possibilites in Stara Lubovna. You just have to find them and to use it. Stara Lubovna has a sport-centre, a cinema and a wonderful pub and other things. It is easy to integrate in the social-community, if you are open for it. You can have a lot of friends and go out in the pub into the club here or you can stay at home. The Youth in Stara Lubovna is very nice and funny. It doesnt mater which type you are, you will find somebody and something. During the weekends we visited a lot the other volunteers, travelled to the cities and most beautiful-places and discovered the country and our personality. A year can be a long time...and also very short. Daniel already will leave in July, Paula in August and Masha will stay here for longer. We had a lot of experiences. We laughed, we cried we argued, we worked, we drunk... Finally everybody of us can say that he explored and discovered a big part of his personality. Of course this year is not just full of fun, peace and lovely atmosphere especially, when you live together in one flat for one year. In EVS you can not chose with whom you will live together, so you have also to expect that two or three people not always have the same opinion about life-, working- and living-style. In EVS you also learn how to arrange yourself with circumstances you are not familiar with. If it is a missing wardrobe, a short bed or just general problems in the flat within the volunteers. Be prepared for everything, because you will not live a year on holiday...NO, you will have a year of your personal life. You will know your personal borders, develop your character, discover new talents, deal with harder and less harder problems and learn how to arrange your life with all these components.